I consider myself a fan of Harry Potter. Yes, I was a late adopter to the series (I only started watching the movies in 2005 and started the books after that) and I’m also about 20 years older than its target audience. But am I? That, to me, was the enduring appeal of the character is that he (and the story) was equally applicable to both children and adults. But that series ran its course and now we’re got more of a spin-off with the Fantastic Beasts films. And while it’s not necessary that viewers of these new films be familiar with Potter-lore, I’d be surprised if someone watched these films and hadn’t at least seen one of the Harry Potter films. 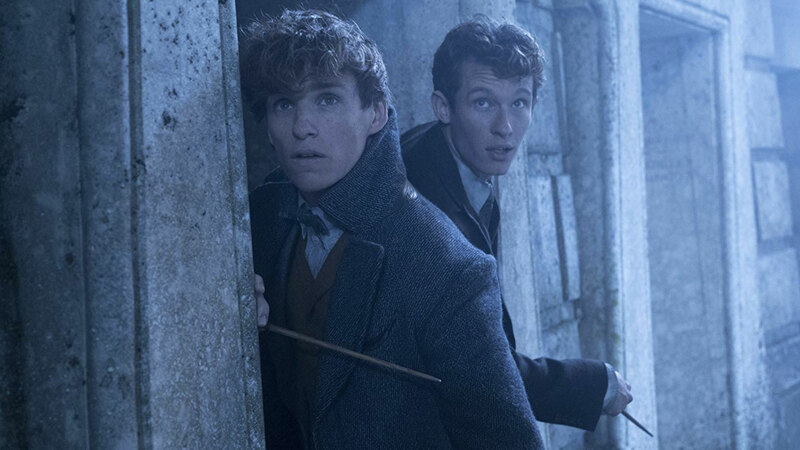 Fantastic Beasts: The Crimes of Grindelwald takes place just after the events of the first film: Fantastic Beasts and Where to Find Them. We’re also introduced to a few new (or old, depending on your point of view) characters. It’s assumed that the first installment of Fantastic Beasts…has been viewed. If not, I’d stop here and go watch that film. There’s business to be taken care of here. We once again follow titular character Newt Scamander (Eddie Redmayne) and his merry band of eclectic associates. It so happens that Gellert Grindelwald (Johnny Depp), who was imprisoned at the end of the first film has, well, escaped. He now advocates to his fellow wizards to make a decision and choose a side in a potential war between muggles (humans) and wizards. To further complicate things, Newt was banned from traveling abroad after destroying half of New York City in the last installment. He’s assigned by Albus Dumbledore (Jude Law) to track Credence Barebone (Ezra Miller), widely thought to have perished at the end of the last film. Add to that a slew of other characters and you’ve got somewhat of a mess on your hands. No one is going to tell J.K. Rowling “No.” Especially not Warner Brothers who have literally raked in billions thanks to her films. She wrote the screenplay for this and with a supposed three more films to come, maybe they’ll make a bit more sense. Director David Yates is certainly no stranger to the Potter universe, having helmed this films predecessor as well as the last four Harry Potter movies. It seems that this movie suffers from having too much in it. About half way through I said to myself “what’s going on?” That’s not a question one should have to ask. To further things on my end, I feel that watching these films is somewhat akin to watching Better Call Saul, itself a spin-off of Breaking Bad. In that I mean we want to get to the point where the worlds collide, but we’re simply just not there yet. While it was nice to see Hogwarts and Dumbledore and a few names like “Nagini” and “Lestrange”, I just don’t feel we’re there yet. That aside, the film did manage to rake in over $650 million worldwide, so it’s clear that we’ll be seeing Newt and his band of misfits in more installments. I’m willing to bet that any film with a budget of $200 million dollars will look good, at least from a production value standpoint. And let’s face it, all of the Potter films as well as the first Fantastic Beasts have looked glorious – no detail overlooked. Such is the case with this film and its 4K presentation. The 2.40:1 HEVC 4K image simply oozes with HDR, tack sharp detail and everything in between. The definition in the tweed suits, the individual bricks in the buildings and so forth; they all look amazing. Contrast is strong, shadows show no signs of artifacting. This is one of those films that, despite being all over the place with its story, will look good. Even the included Blu-ray dazzles and sparkles without the benefit of high dynamic range. This one’s a winner, folks. The score is a bit different from those in the Harry Potter series, but James Newton Howard’s take in this film is simply marvelous. And yes, there is an ever-familiar tune that longtime viewers will immediately recognize. The included Dolby Atmos soundtrack pulls no punches. The apparations are constant and sound stunning, likewise the surround effects and atmospheric aura abound. Vocals, as expected, are rich, crisp and pure and with the diverse cast, we get a solid range of vocal dynamics. One doesn’t watch a film like this and leave disappointed, not when it comes to the technical aspects. This one, like all films in the Wizarding World, delivers. Supplements: What are the extras? A few caveats: All of the supplements are found on the Blu-ray. The Ultra HD 4K Blu-ray disc is the film only. Secondly, the Extended Cut is only available via the included digital code. The discs contain the theatrical cut only. Extended Cut – Seven more minutes are included, though this is only available via the included UV code. J.K. Rowling: A World Revealed – Rowling explains setting up this world and how it’s different from the Potter world (though it’s actually all the same) all the while Producer David Heyman and Director David Yates serve as glorified “yes” men to everything she mentions. Wizards on Screen, Fans in Real Life – Ezra Miller, who played Credence Barebone in the film and Evanna Lynch who played Luna Lovegood (she is NOT in this film) geek out over the fact that they’re in these films and are, obviously, fans in real life. Distinctly Dumbledore – Jude Law, who plays the iconic character in the film, is joined by Producer David Heyman, Director David Yates and Costume Designer Colleen Atwood. They discuss the character, his motivations, look and feel and we see the older version via a series of clips from the Harry Potter films. Unlocking Scene Secrets – The most robust (and arguably the best) supplement on the disc is this where we have half dozen scenes broken down. We get different perspectives from the visual effects to the actors to the production of these scenes. This one is worth a watch. Deleted Scenes – Shown in a rough form, these aren’t fully fleshed out scenes, but it’s nice to have them included. It’s a stretch to say that this is the “worst” offering from the Wizarding World of films. That’s subjective. While I was a bit lost and the, pardon the pun, magic, of the first film is somewhat lost. But Warner and the viewers are pretty invested at this point in time. Three more installments are planned and I have to believe that J.K. Rowling will find a way to bring it all together. The 4K disc looks and sounds amazing and features just enough supplements to warrant a purchase. But die-hard Potter fans won’t need me to tell them that.